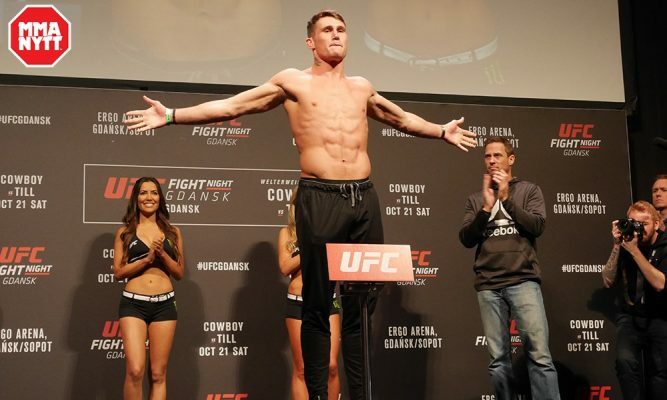 Darren Till is headed to middleweight. The former title contender who has admittedly struggled with the rigorous weight cut down to the welterweight limit has decided to make the move to 185 pounds now rather than later. Ahead of his title fight against Tyron Woodley at UFC 228, Till said that middleweight was in his future but he still anticipated a few more fights at 170 pounds. Till ultimately fell by second round submission to Woodley so he’s going to opt for a healthier lifestyle by moving up a division for his next fight. “I’m a big dude for welterweight to be honest, so that’s probably going to be my last fight at that weight,” Till said to his sponsors at Paddy Power. “Welterweight isn’t fully gone for me, but I’m going to be happy going up to middleweight now and I’ll be strong at that weight not having to cut as much weight. Till went onto explain that he wants to compete at a weight where he can be fully nourished and no longer depriving himself for weeks at a time just so he can make the welterweight limit. In the long run, Till believes this move will be beneficial to his fighting career as he’ll be healthier and definitely happier not to cut down to 170 pounds again. “I’ll have a few fights at middleweight and you never know, down the line if Woodley is still about then I can have another go at him, that’s a rematch I want,” Till explained. “The future’s bright, I’ve got another 10 years in this sport. It’s not that I can’t make the weight. I’m just a big lad so I just have to be on such a strict, regimented diet and being honest, I don’t like doing it. There’s no word yet on when Till plans to compete again, although with the majority of cards for 2018 already filled up, it’s likely he won’t step back into the Octagon until 2019. That said, it looks like the middleweight division has a new contender with Till moving to 185 pounds.